Lay’s, Thailand’s No. 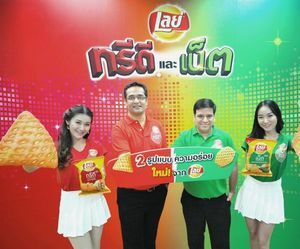 1 best-selling potato chips, led by VishalKaul, General Manager – Foods (2nd right) and Nitin Bhandari (2nd left), Marketing Director – Foods, both of Pepsi-Cola (Thai) Trading Company Limited, breaks new ground in Thailand’s snack industry by introducing two new fun-shaped snacks called “Lay’s Net” and “Lay’s 3D” for the first time to excite THB 8.6 billion-valued extruded snacks segment. Aimed at targeting young adults, the new products are potato-based snack with great flavors from the Lay’s brand. The launch is supported by an impactful marketing campaign together with a widespread sampling program that will reach 300,000 consumers.